On March 13, 2019, the announcement that Dwarf fortress was coming to Stream and itch.io with graphics hit the web. Within 12 hours, the teaser trailer on YouTube amassed over 100,000 views. Dwarf Fortress is the “most incredible and impressive video game you’ve probably never played.” News spread across the internet that the creators, Zach and Tarn Adams, normally quite private about their personal lives, made the decision to release on commercial platforms to create a more stable source of revenue for themselves. Their reason? The need to be able to afford healthcare. Lack of access to affordable healthcare, and societal stigmas surrounding health, negatively impact people’s lives every day. With Zach and Tarn’s backing, we are writing a series of blog articles to help raise awareness about these issues. The complexity of Dwarf Fortress is a reflection of its creators. Humble, quiet, dedicated, the Adams brothers never regarded themselves as warriors for social justice, and certainly not activists. 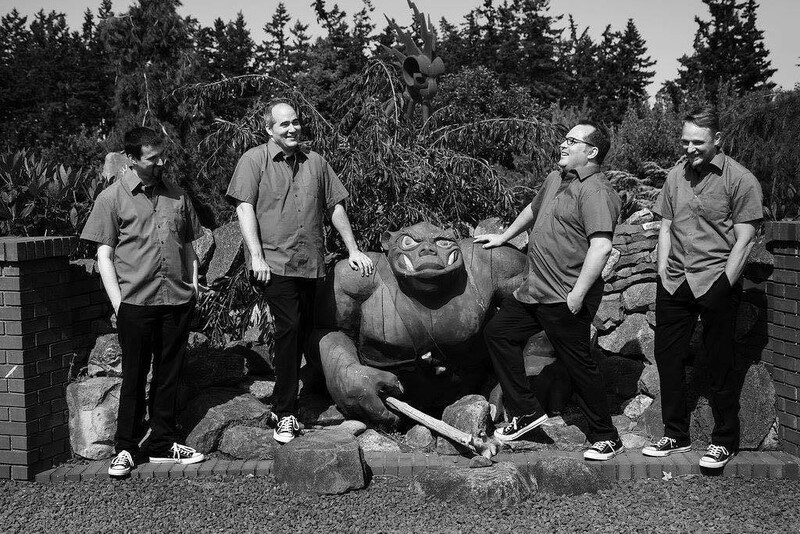 They thought of themselves as game creators, chipping away at their corner of the world, doing not only the thing that they love, but the one thing they felt truly called to do. What they could not predict was that they weren’t just creating a game, they were creating an alternate world. A world where everyone was welcome … well, as long as you don’t mind having all your dwarves die every once and awhile (okay, maybe a lot). In the process, they have, perhaps unintentionally, inserted themselves into a global conversation about diversity, inclusiveness, community, and even healthcare. In order to get a fuller picture, Annie would like to share part of the story of her life with Zach. Sitting in the bedroom of the house that would eventually become our first home together, Zach took a sharp inhale. He spat it out with the weight of the thousand bricks he had been carrying since we first started dating. Zach was taken aback, probably for the first time ever, at how someone could not only effortlessly digest the information, but that I immediately wanted to know how I could help. 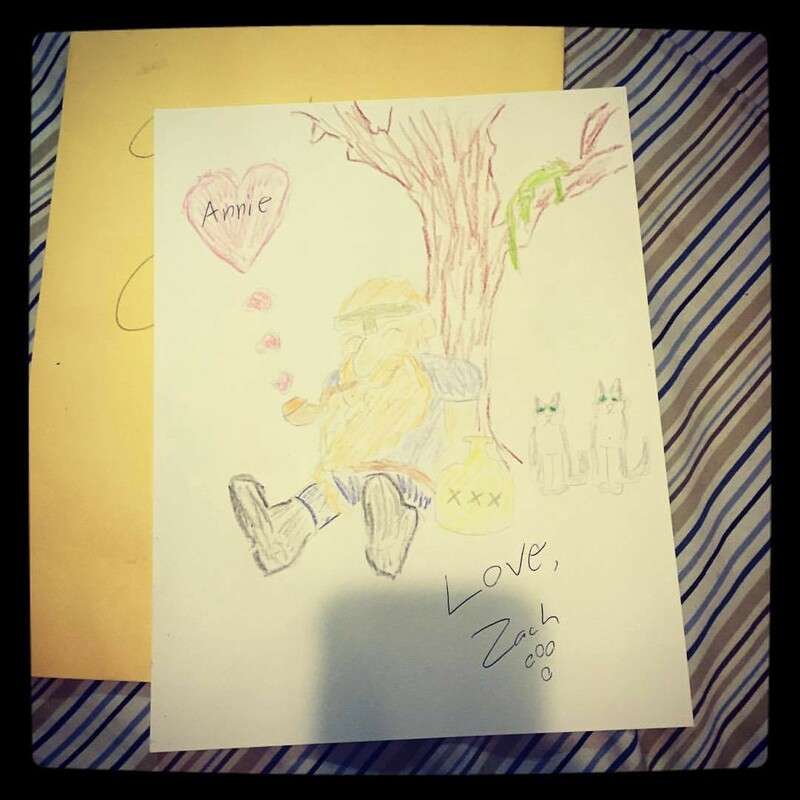 Dwarven art for Annie from Zach with love. The truth is, in the years since that initial conversation, the acceptance and personal management of Zach’s mental health was never the scary part. Like most young people in love, we gradually shared with each other the story of our lives. I told him about my experiences with sexual assault, my difficulty growing up with a mom who also struggled with mental health, and a family wrought with addiction. He slowly told me more and more tales of his struggle to be diagnosed and the stigma he faced because of the pattern of his illness and the ways it would manifest. As our relationship grew, it became important that we talked about how we wanted to manage his mental health, and what tools we needed to do that. The healing process is never straight forward. There were good days, bad days, and really bad days. There were medications that stopped working for no apparent reason, sleepless nights in emergency rooms, and many, many tears. We realized quickly that the main obstacle to care was health insurance. At this point, Zach was limiting his hours with Bay 12 Games so that he could make a small living, and maintain access to the scant amount of public health insurance that was available. He was unable to access certain public assistance, because most of the time he seemed, well, totally normal. He would go months and months without episodes, and every time he needed to renew his benefits, he was constantly trying to convince others that he really was sick. It was this insurance that was the only thin lifeline tying him to the rest of reality. The fear of losing coverage was constant, as the costs of medicine, medical appointments, and everything else that came along with managing a chronic illness would have bankrupted us, even with the generous and unwavering support we had from our families. Eventually, circumstances began to shift. I started working and that allowed us to have the income we needed to buy insurance through the Affordable Care Act, which gave some relief. With the shifting political climate the coverage didn’t change, we just now paid hundreds of dollars a month for it. That enabled the boys to make the switch over to Patreon, which then meant Zach was able to work more and longer on the one thing he had always considered his life’s work: Dwarf Fortress. After a particularly jarring and sudden mental health incident, we decided that the current plan wasn’t working. We were married at this point, so at an enormous financial cost, we added Zach to my work’s health plan and began the difficult process of finding a doctor that would stick with us while we tried to find better solutions. The long standing psychiatric medication was having physical side effects, and some days, Zach was so tired he slept upwards of 15 hours a day. Yes, he was stable, but this is not the quality of life we wanted for him, or for anyone. Our new doctor not only took our concerns seriously, but she listened to us, never judged us, and, most importantly, she worked diligently with Zach to find a combination of medications that kept him stable, and functional. The light returned to him. And our health insurance helped us get some control over our lives. So, this is the part where we ride off into the sunset, right? Not quite. Managing Zach’s health remains a daily activity. Recently, we became concerned about a small tumor that had been on the side of his nose for a number of years. After a visit to a specialist, it was determined to be cancer. It was removed, only to grow back within a matter of months. It came back with a vengeance and resulted in Zach having partial reconstructive surgery of his face. It required numerous appointments, surgeries and he will continue to need to be screened for additional cancers for the rest of his life. We are not unique in this struggle. The rising cost of healthcare for someone with multiple chronic conditions is a real fear for many Americans. We continue to make significant personal sacrifices in order to prioritize his health. We have made more than one major life decision, about employment, education, living arrangements, and our wedding, around these constraints. We are lucky, because we have the resources and support to do this in a way that doesn’t bankrupt us completely. But the fact remains that our life is guided by access to quality healthcare. His life, quite literally, depends on it. This story is important to tell, not just because of Zach’s perseverance and courage, but because this story is the story of Dwarf Fortress. Dwarf Fortress is the product of two brothers; their ideas, their minds, their imagination. Its success is dependent on them. And the reality is, the future of Dwarf Fortress is inextricably linked to access to dependable, quality healthcare, no matter the cost. The best part though, is that you can help us change how this story ends — not just for Dwarf Fortress and the Adams brothers, but for all of us. Too often we read in the media about how video games incite violence or incur horrible, anti-social, addictive behavior. The stereotypical nerd in the basement is derided, but in this stigmatization, this oversimplification, society overlooks the reality of the people making, sharing, and playing games. But there are things you can do to help. First, if you are in the United States: vote, please. Second, support your favorite indie game makers and other artists. For example, you can support Dwarf Fortress over at their Patreon site right now. And you can follow Bay 12 Games and Kitfox Games on Twitter to learn more ways you can support the indie game scene. Third, share this story and share your own stories. Together, we can fight to end stigma against mental illness and disability. Annie Forsman-Adams is a student, educator and indigenous activist. Her work focuses on ending violence against indigenous women and understanding the intersection of race, gender, criminology and criminal justice. She became a member of the Dwarf Fortress family when she met Zach in 2013, and since then has become a vocal supporter for visibility and inclusivity within the gaming world. You can find her on twitter (@theothertuklus) where she shares what life is like inside Bay 12 games (and a whole lot of animal pictures). Kate Ringland is an avid gamer and disability advocate. Having earned her PhD in Informatics from the University of California, Irvine, her research lies at the intersection of disability, games, and technology. She is currently a postdoctoral researcher at Northwestern University designing technology to support individuals with depression and anxiety. You can find more about her at her website: https://kateringland.com or follow her on twitter @liltove. Acknowledgments: Thanks to Sev Ringland for his copy-editing! If you want to read more about Dwarf Fortress from our perspective, check out our entire publication series, The Fortress is for Everyone, where will be adding more content soon! Articles about accessibility, inclusivity, and games.